Gallia Academy’s Gretchen McConnell (8) maintains possession of the ball during the Blue Devils’ Ohio Valley Conference soccer match against Chesapeake on Sept. 28 in Centenary, Ohio. GAHS teammate Justin Day (7) looks on. CENTENARY, Ohio — Sometimes, you just have to take what you can get. 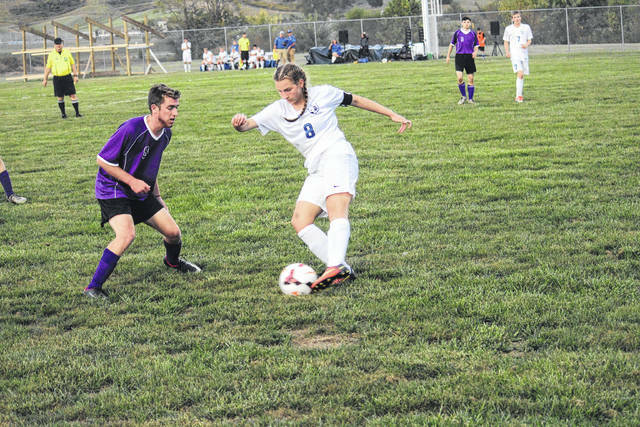 For the young Gallia Academy High School soccer squad, the Blue Devils — despite winning just one match out of 17 total this season —did land four players on the all-Southeast District Division II team, which was announced on Monday. After the season with the most victories (11) in school history, but also after the departure of 13 program players from that standout club, the Blue Devils endured a 1-12-4 campaign this year. Their four draws were twice against Fairland in Ohio Valley Conference competition, once against South Point, and a scoreless deadlock at non-league rival Point Pleasant. They defeated South Point for their only triumph, and were unfortunately outscored 60-7 in those dozen defeats. Still, they managed a foursome of all-district honorees, including three boys and one girl, as the young lady was named to the Division II Honorable Mention list. Gallia Academy is a co-ed club, despite the postseason honors being divided into boys and girls. The lone lady honored was junior defender Gretchen McConnell, as the Blue Devil boys did have one first-teamer, one second-teamer and one Honorable Mention choice. Justin Day — a junior midfielder and forward who led the Blue Devils in goals — earned first-team accolades, while the second-team pick was sophomore midfielder and defender Ian Hill. Andrew Toler, a sophomore who opened the season as the starting goalkeeper before being switched to defender, took Honorable Mention. McConnell, Toler, Hill and Day are all first-time all-district selections. Pierce Wilcoxon, the only senior who played on a regular basis and who represented GAHS in Sunday’s Southeast District all-star match, was moved to keeper. Michael Norris of Alexander was the Division II boys Player of the Year, while John Weber of Hillsboro was tabbed as Coach of the Year. The all-Southeast District soccer teams and subsequent awards are selected by the Southeast District Soccer Coaches Association.